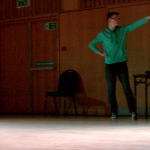 We were back in the wonderful Ardross Hall for our May experiment that involved some rather exciting LED lighting, hired with funding assistance from the Voluntary Arts Festival. The idea behind using lighting was to experiment with creating different atmospheres and using the lights to react to the movement and music going on in the space. 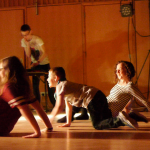 Two of our young people immediately zoomed in on the lighting desk and before long had started experimenting with light and dark, red, amber, green and what can only be described as disco! The different lighting states created an exciting playground – one boy in particular said that it was “the bestest thing ever” and it seemed to free everyone up to play around with movement more – perhaps because we spent quite a lot of time dancing in the dark! SOAR April 2017 Stretchy yellow from Julia McGhee on Vimeo. SOAR April 2017 Balloons and Statues from Julia McGhee on Vimeo. Coming into SOAR is always a joy: the main focus is on play and letting children and young people lead that play in a safe, supportive environment, where many of the playworkers are young adults, both male and female, some in 5th or 6th year at high school. It’s a great mix with lots of energy and laughter and good chat. It does mean however that it is a very different working environment to Ardross Hall where we’ve been holding the workshops to date. The hall is a beautiful big clean space, with a lovely wooden floor and we’ve been working in small numbers in a focussed environment. At SOAR we have the limitations of working in a classroom with furniture, school work covering the walls and a non-slip floor. Plus we’re in a setting where people come and go, chat and ask each other questions, or maybe just want to play with the dolls instead! But that does bring up some interesting ideas about how we create a more focussed environment in somewhere like a school. Perhaps we construct some sort of giant indoor tent that can sucker onto the classroom walls (with leaving any damage, of course) to create a blank canvas and give the space a more definite feel of a performance area. The other thing that going into SOAR highlighted was that live music – whatever form the music takes – gives an immediate focus and removes the need to talk. 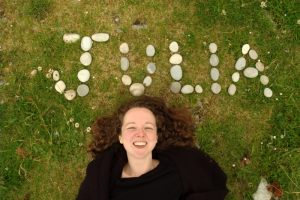 Interactive Experiments Workshops 21st Feb from Julia McGhee on Vimeo. This project is about exactly what it says on the tin: it is about experimenting and interacting. Experimenting with ideas, experimenting with props, sound, movement, dancing, communicating, being together, finding out more about one another. It’s that ‘finding out more about one another’ that interests me and leads to the interacting part. I’m collaborating with a number of young people who I’ve met through an organisation called SOAR Youth Project. 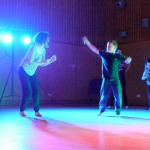 SOAR run a playscheme in the school holidays for 5-18 year olds who have additional needs – this may be learning disability, physical disability, challenging behaviour – often it means that taking part in mainstream organised activity clubs just isn’t possible. 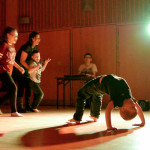 At SOAR however young people are supported, often 1 to 1, by playworkers and the activities are organised in a such a way as to make them fun, safe and accessible to everyone. I was a SOAR playworker from 2013-15 and also worked part-time as a carer for two teenage girls who have autism. 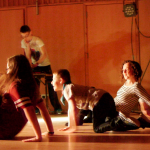 So I’ve been involved in helping to look after young people with learning disabilities for a while but it’s only recently that I’ve plucked up the courage to try to bring together my work as a dance artist with my experience as a support worker. Why has this taken so long? Well I think it’s primarily the fear of getting it wrong. Working as a dance artist very often means being the one in charge, going out there and doing it by yourself. My experience of care work was very much being part of a team, particularly at SOAR, there always being help on hand, there always being someone to defer to with more experience and knowledge and often someone who knew a young person much better than I did and could help me undersand better how to help them. This is the thing that takes time: getting to know someone. So that’s the starting point for this project: getting to know a group of young people better through offering them the opportunity to know me better – to know me as a dance artist. I’ve decided to run my project as a series of workshops in a local village hall and also to visit SOAR in the Easter and Summer holidays. I led the first round of workshops during the Christmas holidays at Ardross Community Hall – a beautiful building that is a lovely space to invite people to visit and work in. I’d decided to start 1 to 1 to give me the chance to get to know everyone better – young people and parents – and some brought siblings along which was fantastic. The starting point for the workshops has been interacting with materials and noticing how this opens doors to reactions – playing with stretchy things, things that roll or bounce, things that float – and observing what it is that happens and how it feels. 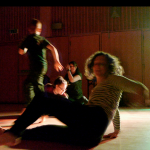 How can I set up opportunities for people to express their feelings non-verbally through body-language and sounds, through movement and through dance? 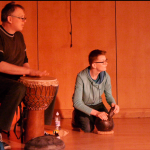 And how can I create space for everyone’s different ways of expressing themselves to happen and to be recognised? How do I share this with others – with parents and carers, with a wider audience and with the young people themselves? What form is this sharing going to take – is it a live performance, is a documentary, is an installation, is it a CD of music, is it booklet of games to play? I’m starting to think this project could be any or all of these things. And maybe I don’t have to choose right from the outset, maybe through the process and the collaboration these decisions will be made for me. Having said that though, I have made two very important decisions already – I have decided to collaborate with a musician and a filmmaker. So already the possibilities for making a CD of music and producing a film are more likely on the cards! 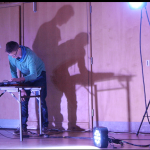 Quee MacArthur – musician and composer – will be making music in the next round of workshops in February and Robbie Synge will be on board as an outside eye filming the day’s events. We’ll be working in small groups this time – 3 to 5 young people in each group. I’m keeping the numbers small so I can really pay attention to everyone, be a better listener, and hopefully find out more about everyone.